University of North Texas Press, 9781574417180, 336pp. In Captain Jack Helm, Chuck Parsons explores the life of a lawman in post-Civil War Texas, John Jackson “Jack” Helm. Previous biographers have neglected this man, whose main claim to fame has been that he was a victim of man-killer John Wesley Hardin. 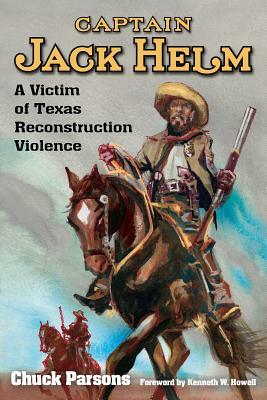 That he was, but he was much more in his violence-filled lifetime during Reconstruction Texas. Beginning as a Confederate soldier, he soon changed allegiance and became a fervent Unionist. With a quasi-legal hanging in his background, Helm focused on establishing law and order in Central and South Texas. At first a deputy sheriff, he quickly assumed the role of a Regulator and soon was recognized as the leader of a group of vigilantes. During this period as deputy sheriff, then county sheriff, and finally captain of the notorious Texas State Police, he developed a reputation as a violent and ruthless man-hunter. He arrested many suspected lawbreakers, but often his prisoner was killed before reaching a jail for “attempting to escape.” This horrific tendency ultimately brought about his downfall. Helm’s aggressive enforcement of his version of “law and order” resulted in a deadly confrontation with two of his enemies in the midst of the Sutton-Taylor Feud. Jack Helm’s name is on several memorials honoring lawmen having fallen in the line of duty. Helm may never gain prominence as John Wesley Hardin or Bill Longley have, but this biography restores his rightful place among the noteworthy personalities of not only Texas but the entire Southwest. CHUCK PARSONS is the author of Captain John R. Hughes and The Sutton-Taylor Feud and coauthor of A Lawless Breed, a biography of John Wesley Hardin, and The Notorious Luke Short. He lives in Luling, Texas.